An active, caring and inclusive Reform Jewish community that is healthy and sustainable. In 2010, the Vision committee was formed to communicate with congregants on the vision that congregants have for all aspects of Temple life. Through research (retreat; forum; Chai member surveys; focus groups; interviews) and quarterly committee meetings with the Clergy and the President, much progress has been made and communicated through the Temple bulletin. Early on, this work was supported through resources and materials provided by the Union for Reform Judaism which calls for a multi-phase approach to set, meet and monitor the effectiveness of the actions identified to achieve the vision over the long term. Specifically, three top priorities arose – Financial Sustainability; Membership (member services/member recruitment/member retention), and; House (the building/space). Additional priorities included the establishment of a Volunteer Committee and a Seniors Committee, a performance management program for clergy and staff and, ongoing professional development training for the Board. The same survey (Chai 2) was circulated to members again in 2014 to determine if progress had been made since the 2012 benchmark survey and to see if new priorities were emerging. The 2014 report identified 5 areas of focus for the board, Clergy, staff and members and provided a list of improvements, based on the 2012 recommendations. 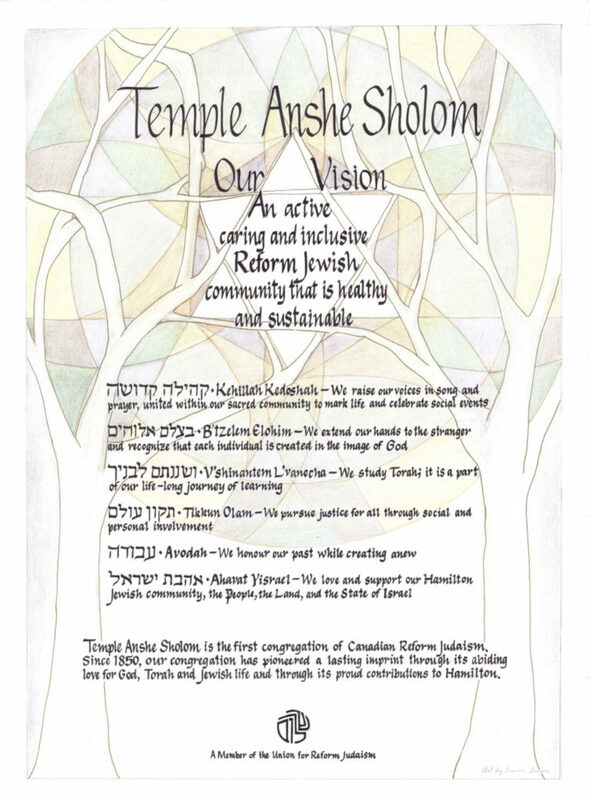 It also stated that since the 2011 survey, congregants had become more optimistic and their perceptions of Temple Anshe Sholom were more positive. Members recognized improvements on all 18 topics listed in the survey. A second measurement – “sense of importance” – had also increased with people caring more about TAS. Areas with the greatest improvement for members included involving youth in Jewish life, communication, ritual, spiritual needs, adult education and youth education and seniors programming. In 2016, the Vision committee checked in with members with a short survey to ask members for “one improvement [you] would like to see the Temple Board of Trustees, the Clergy and the professional staff do to improve the Temple experience and Temple community” and the, “one thing you could do to improve your experience at Temple.” Answers covered matters concerning the Board, finances, Clergy, Staff, pastoral, facility, programming, community, membership and other and were shared with the Board via the President for implementation. We are truly grateful for the dedication of this committee and its leaders Dr. Richard Levy and Ginny Levine. In May 2018 the work of this committee concluded its mission of determining the vision of our community and recommending areas to work on. These areas are the focus of newly formed task forces and committee work.